On May 23, 2011, I arrived in Manta, Ecuador with the intention of researching the Real Estate market and possibly purchasing property. After asking around, I was introduced to Richard Parker and Lorena Sanchez, who represent Ecuadorean Coastal Properties. I explained that I was looking for property that would potentially appreciate in value,and be used for a base of operations for South and Central America. Richard showed me numerous properties, but the one that got my attention was a condo complex on the south side of Manta called Nerea. After several days of viewing comparable condos, and becoming familiar with Manta and the Real Estate market with the courteous and professional assistance of Richard and Lorena, I purchased my unit in Nerea. Richard and Lorena , over the course of my 2 week stay, were able to answer all of my questions, and steer me in the right direction based on my requirements. I look forward to the completion of my condo in May, 2012, and fully anticipate the same kind of professional treatment from Richard and Lorena during the build- out and furnishing phase. My wife and I were looking for an investment abroad, a well located, low cost property…a place with a strong potential of property value increase within next years. Manta, Ecuador is the location we have selected to buy our first property abroad. This city of 300,000 inhabitants is along the beautiful Pacific Ocean and has a very dry climate with temperatures low and high of 20 C (68 F) and 30 C (86 F), during the entire year! Also there are no hurricanes in Ecuador. Manta is the city with the best potential of growing in the country. The Ecuadoreans are planning , here, the construction of a new huge Harbour and of a new International Airport. New industries are also opening (Hyundai cars assembly line is one of these). Manta is known for its important tuna fishing industry. In reading about Manta, I found out that Mr Richard Parker is the best real estate agent and ”The Specialist” of this city full of life. Mr Parker is a very helpful and trustworthy man. With his great help, we bought (on pre-construction) a one bedroom condominium on the 6th floor of The Nerea…It has a beautiful ocean view (we saw whales from it) and is located inside the nice Barbasquillo area of Manta. We bought the condo in May 2011 and visited the construction site, for the first time, in August of this year. Our condo has already risen 15% in value since we purchased it. The Nerea Architect, Mr Jose Atiaga, is doing a great job building the project. He was there to help us in our specific needs. The Nerea construction should be finished by May 2012. Then Mr Parker and his team will take care of all the furnishings and getting the apartment ready for us to vacation in. After staying in it for our next holiday, we are planning to rent our condo with the great help (again) of Mr Richard Parker. We are very happy and impressed with the professionalism and hard work that Richard Parker and his team in Manta has shown us. We are not only clients, we are friends. “I tried for several years to locate and to buy properties on the coast of Ecuador. Many Ecuadorians attempted to show me properties during this time. However, all of the properties always turned out to be oranges when I had very specifically asked for apples. Also, the Ecuadorians attempted on more than one occasion to inflate the values of properties in order to secure for themselves a fat commission. 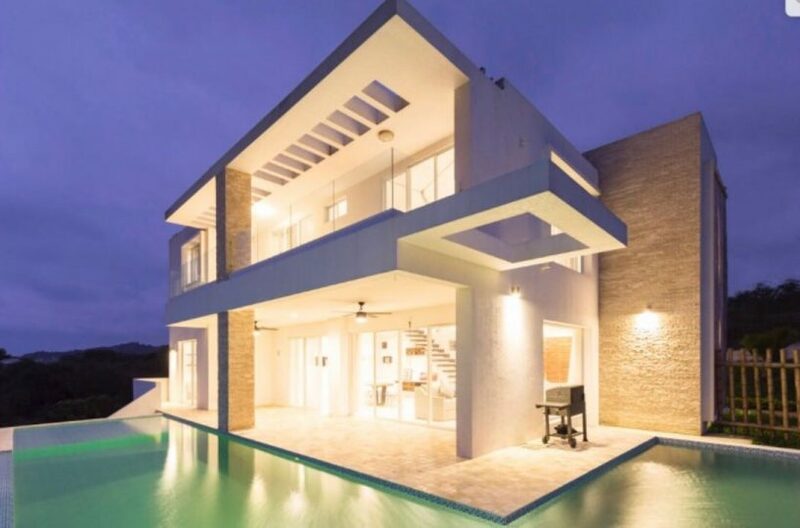 On one such occasion, the property was inflated from the real asking price of $900,000 to an unrealistic price of $2,100,000 thus ensuring the Ecuadorian real estate person a commission of $1,100,000. Needless to say, I did not buy this property nor any other from these salespeople. Richard Parker is a rare real estate agent. First of all, he loves his job. There’s not a day in the week when he’s not focusing on some aspect of property sales or rentals. Richard’s curiosity about potential property acquisitions is boundless. He’ll take a long dirt road to nowhere if he thinks there’s a possibility that a unique real estate opportunity lies at the other end. It is this inquisitiveness which has steered many clients to just the kinds of deals that they had envisioned. Second, Richard’s enthusiasm for finding properties gains him many contacts, including furniture makers, interior decorators, electronic experts, importers, and craftsmen of all stripes. These come in handy, especially for expatriates moving to Ecuador. Third, he is ably assisted by Lorena Sanchez, who grew up in the Manta area, is bi-lingual in Spanish and English, has a keen mind, loves her job, and probably has the sweetest disposition of any woman on the coast of Ecuador. Finally, and perhaps most importantly, Richard doesn’t just collect a commission, and move on to the next client. He takes great pride in making sure that each customer makes the transition to Ecuador in the smoothest way possible. If this means assisting with the physical aspects of the move, helping with paperwork and translations, or just making helpful suggestions, Richard is your man. In my case, I purchased my property over a year ago, and paid Richard a commission. Yet, he’s still helping me with the day-to-day hassles which occasionally arise in any new country. If you’re seeking real estate in Ecuador, Richard Parker is your man. “Having almost given up hope of what I was looking for, Richard Parker showed an amazing aptitude to interpret what I needed and at very short notice showed a variety of suitable properties. His strong local knowledge and deep appreciation of the needs of expatriate buyers ensured that I was launched on the process of buying a building lot “to die for” the very day I was leaving. I can only recommend Richard very highly”. It has been our pleasure to have Richard & Lorena, owners of Ecuadorian Coastal Properties in our lives, both personally and professionally. Our association really began last September. We e-mailed Richard asking him to intervene on our behalf in making contact with a project in Cotacachi that we were attempting to purchase. We were out of the country and could not get anyone to respond to us from their organization. Although Richard was able to contact them they still did not respond to us. This lack of response was a blessing in disguise for us, as now we have purchased in Manta. Thanks to Richard at Ecuadorean Coastal Properties, we are now the proud owners of a wonderful condo on the beach. As this condo is new, it needed to be completely outfitted. Since we cannot communicate in Spanish as yet, both Richard and Lorena were invaluable in translating and negotiating our purchases. The time they invested in assisting us was above and beyond the call of duty and we will be forever grateful. Having met many other expats while in Manta, the consensus is over-whelming. Richard Parker is THE realtor to assist you in your search for property in Ecuador. And now even better, Richard’s son and daughter in law has added their skills in with the business as well. They both market on Facebook and the beautiful website you are looking at now…. Ecuadorian Coastal Properties were chosen by House Hunters International to film a segment on their show of Manta. That segment is now the top show in the series of HGTV HHI…We are very proud to have Richard and his whole team as our realtors and friends. Should anyone wish to communicate with us for further information they can reach us at my email below and we will provide a phone number if desired. My husband and I attended an International Living conference in Quito this past March and signed on for a coastal Real Estate Tour beginning in Salinas and ending in Manta. We had a short but informative introduction to Richard Parker at the conference and decided after the south coastal tour to spend our remaining few days with Richard in Manta viewing potential properties. The difference between the two tours was night and day. Richard tells us today that as he waved us off he thought “well, I’ll never see them again.” Less than 6 weeks later – our decision made, we contacted Richard who found us a gorgeous brand new ground floor condo to rent and we flew back to Manta in May with our two dogs and four suitcases. Richard’s realtor duties did not end with the condo however, and he has since become an integral part of our life here and has become a good friend. My husband and I have no hesitation in recommending him and Lorena Sanchez for any Real Estate residential and business requirements in the Manta area – they made our transition to early overseas retirement a great and happy experience for us. My husband is from Ecuador, but hasn’t lived there for many years. We want to call Ecuador home when we retire, and so we took a trip in September of 2008 to do some exploring. We were fortunate to have been referred to Richard by a couple we met by chance in Cotacachi in September 2008. The rest is history. Due to some scheduling mishaps we only had one day to visit Manta, a place that we wanted to spend several days exploring. From the minute Richard answered our desperate call with openness and enthusiasm, we knew we had found the right person to introduce us to the Manta lifestyle. We were immediately caught-up by his high energy, his knowledge of the expat lifestyle in Manta (he lives it & breathes it) and the local culture. He knew instinctively what we would benefit from seeing. We spent a non-stop action packed day with Richard. We met other warm and friendly expats, viewed high rise condos, and development projects, visited homes, trekked through the hills surrounding Manta and even climbed a home made lookout post on a hilltop to view whales! All that and lunch (soup, main course & dessert for $2.50) too! We accomplished everything that we had hoped to in one day with Richard’s invaluable expertise! We could not have asked for a better introduction to Manta and the expat lifestyle that we hope to adopt soon! Since our visit, Richard found us the perfect oceanfront condo in the building project that we fell in love with during our whirlwind tour. Richard and Lorena are managing our condo for us, including the furnishing of it, which we know was a lot of work. To this day, and I know it will continue, they have been very responsive, caring, and always open to share ideas and information with us. We consider them our friends. Thank you, Richard, for your professionalism, care for your customers, and most importantly, your friendship. I have been asked by Richard to give everyone that is interested an insight regarding my experience in my dealings with Ecuadorean Coastal Properties. I’ll try to be as brief as possible but it is going to be really difficult to do it justice in just a few paragraphs. So I will be brief and include my personal e-mail address if anyone would like to contact me directly for more details. I first came to Ecuador 2 years ago looking at various properties all along the coast and some in the highlands. I worked with 4 other agents before meeting the good people at Ecuadorean Coastal Properties. I had several priorities during my search and was able to satisfy all my needs with their help. Through them I found the perfect property then was introduced to a general contractor to build my dream home. With the general contractor they also introduced me to several specialty contractors to give me the exact finish details I wanted. The project came in on budget but just a little over the time line, very little. Throughout the project I was transferring money to them to pay for everything and they kept track of every dollar along the way and I was never concerned about sending the cash as I was living out of the country at the time. Good morning from Bozeman, Montana. I am looking out the window at 2 – 3 inches of fresh snow, and thinking about the obviously better option of looking out at the beach in Manta!! We are so happy and grateful to have met you in Ecuador. Thank you for the time you spent with us and the information that filled our heads and our hearts with the desire to return. We have much to do here in Montana before we are free to adventure permanently to Ecuador, but we will be back to visit sooner that we are ready to move. And when we are ready to make a change, we hope to be able to contact you for some expert assistance! Again, thank you – we really enjoyed our trip to Manta! “My wife and I traveled to Manta in March 2018 to visit a close family friend who had purchased a condominium in Manta. Our friend was very impressed by and grateful for the expert assistance provided by Richard throughout the process to find the right place. Richard went well above and beyond what you would expect an agent to do and during all of this, our friend and Richard became good friends. We too were impressed by Richard’s handling of those matters and remained in contact with him regarding our possible purchase of a condominium in Manta. Richard found an opportunity for us and after going back and forth with the Seller, worked out a mutually agreeable price. We made a last minute trip to Manta to review the unit in mid-May 2018 and with Richard’s help, made the deal. During this process, we met Richard’s family and had the opportunity to get to know both he and Garrett and the rest of the family residing in Ecuador. We are pleased to call all of them friends and neighbors. I wrote another testimonial for Richard Parker back in May of 2011. Back then I chose a condo in Manta that was still under construction and so it was a little risky for me to buy it. However with Richard Parker’s advice and expertise, we went ahead and purchased it. We rented the property out for the next 2 years and then again with Richard Parker’s help we sold it for a very nice profit. Not wanting to take the money back to Canada, we bought another condo, “Buzios”. This was right on the Pacific Ocean and was being built by good friends of Richards. He was so excited about this because due to Richards experience and knowledge of the local builders and other Ecuadorian friends, he was able to get us a much larger discount than any other agent in Manta. This was a very beautiful condo with beautiful views. We rented this one also collecting nice income along the way. We also decided to sell this one with Richards help and you guessed it, great profit again. By now we were seeing the light. The way to prosperity was through the help of Richard Parker and his team. We sold Buzios and literally bought another “our dream home” condo the last day we were in Manta. This one “Plaza Del Sol” is where we are going to retire to. It has everything we want in a retirement condo. Also I need to say that thank goodness our condo was not damaged at all during the earthquake. During the time after the quake, Richard collected beautiful furniture and appliances at 70% off normal prices. This is what he does best. He makes sure you are taken care of every step of the way. Thank you Richard for everything! Many thanks to my old friend Richard Parker who saw me walking along the road recently and asked if I wanted a lift. Well having known Richard for at least 11 years or more I knew he wanted to show me something. Usually it is a house or apartment for sale as he has sold more properties than any of the other real estate agents on the coast and works at it very hard to find what the clients are seeking. So I jumped into his truck and he said today I am going to show you something you will appreciate, the quality and workmanship of the new Sail Hotel in it’s final stage of construction. Richard knowing I have contracted many large buildings in Sydney, Australia and other locations around the world, wanted my professional opinion. I can truthfully say the construction I observed was some of the best I have seen in Ecuador in all phases including piping, electrical and civil, it was all a first class job. The ball rooms were comparable to hotels in Las Vegas including size and appointments. The attention to detail and the finish work is second to none. This is truly a new vision for quality construction in Ecuador. I wish to visit again when construction is completed to see all the details they envision put into place. After spending two hours looking at the Hotel Sail, Richard and I spent another couple of hours looking at other new properties around Manta to see how they were coming. I am amazed at the contacts Richard has made in his 11 years here in Manta. If anyone is considering a trip to check out “my home” Manta, Ecuador for retirement I strongly suggest connecting with Richard Parker (ecuadoriancoastalproperties.com) as he knows everyone along the coast and all the procedures for buying homes and getting your visa work as well. He is always ready to meet and show you all that is available in Manta and all other areas along the coast, with a smile on his face. Even if you decide not to buy anything, Richard makes sure you enjoy your stay in Manta with tours of the jungle and tours of Manta. Richard and his team have sold several properties for my wife and I over the years with excellent results and attention. Feel free to contact me for information. I have lived in Ecuador for 34 years and still love it. The first challenge after my wife and I decided to take an early retirement, was to determine where we wanted to live. After much research, we focused in on Ecuador and the coastal city of Manta. Since I had a few more months to complete a project I was working on, My wife decided to take an exploratory trip to verify if we have honed in on the right location. She came across Ecuadorian Coastal Properties by searching the web and based upon the professional feel of their website and the number of properties in our price range they had listed decided to contact the owner, Richard Parker. That initial contact and subsequent experience that took place over the next several months is why we highly recommend Richard as your “go-to-guy” when considering either a primary or secondary residence in Manta and its surrounding areas. Our plan was to buy a beachfront condo and enjoy the benefits of gaining permanent residency using the Ecuadorian foreign investor program that the government offers. This was ideal was us as we are still both 5 years away from collecting Social Security in the USA. Kim (my wife) booked her flights to Manta and contacted Richard about her pending travel arrangements. From that phone call to today has been one seamless and stress free series of steps. Richard arranged for Kim to stay at a beautiful , reasonably price and well equipped rental condo for the duration of her stay in Manta, picked her up at the airport when she arrived and made sure she was comfortably settled before laying out the plan for the remainder of her stay. It is important to note here that when you engage Richard, you also get to work closely with his partner ( son) Garrett Parker. By teaming with both of them you gain a different perspective of what Manta has to offer and what to expect when living in Ecuador on a fulltime basis. The other major benefit of dealing with the Parkers is that they come with a full network of resources required to support your move. Kim was introduced to a very prominent local immigration lawyer s well as the owners of a local moving and storage company. She was even introduced to a local maid and cook (mother and daughter) in case she wanted to employ those type of services. Richard and Garrett spent the next week showing Kim around and narrowing down what was available based upon her, my and yes even our dog’s needs!! Even though Kim did not find what she wanted, she knew that we would be happy in Manta and told Richard and Garrett that she would get back to them when so back to the States. The next series of events are condensed into a timeline to help explain how easy things happen when you find yourself a trusted Real Estate agent and friend. We do not know if we were blessed by the “Gods of Retirement” and cannot guarantee of results! 2) Our house sold in less than a month. Turn up the heat and bring it on! 4) Richard had the immigration lawyer contact us to clearly articulate the documentation required prior to leaving the states (this step is mission critical). 5) Richard had the moving and storage company contact us and set a date for packing and storing our goods until they could be shipped to Manta. All costs for both services were upfront and actually come out to be both under estimate! 6) Arrived in Manta three months after selling our house, two cars and estate selling two thirds of our possessions. 1) Settled into our Rental Condo which was already supplied with the basic foods so we could relax before we could go grocery shopping. 2) Alternated between Richard and Garrett looking a properties both in Manta and along the coastline. 4) Found our perfect piece of heaven, made and offer and it was accepted! 5) Closed on the Condo and moved in 30 days after our initial arrival. It was partially furnished so we did not have to wait for our goods from the States. Also, the paperwork to complete the deal is very simple compared to back home. 7) Bought a car through the help of our lawyer and then he took care of all the paperwork for us and dropped it off at our front door. 8) Got our cell phones. The lawyer actually brought a Rep from the cell phone company to our rental condo to do the paperwork for us and then brought us the SIM cards the next day. 9) Opened a local checking account. Again the lawyer did all the leg work for us. 11) Had custom local furniture made again at a deep discount! 12) Got our Permanent Residence cards. 13) Furniture arrived and professionally unpacked. I know that this may sound unachievable and I honestly think it would have been except for Richard, Garrett and their network of friends. To put this into perspective, Kim and I do not speak Spanish (which we are slowly starting to do) so the hurdle we faced was even more monumental than many other people would face if they knew the language! To add to this, we made many new friends through this process including Richard and Garrett of course. They taught me how to navigate the city, showed us where to eat and how to find certain amenities, went to the Vet with our dog, etc., etc. In all my years of selling and buying real estate, I have never worked with a team so vested into making what we would view as basic financial transaction turn into a rewarding, fun and stress free adventure! We take it by now, that you probably understand the value proposition that Richard and Garrett bring to the table. Ecuadorian Coastal Properties is the only way to go when looking for your retirement or investment property and want a full-service Team to assist you! We have given Richard and Garrett our permission to use this testimonial and we would be pleased to talk to anyone who would like more information regarding how we made our dream come true! Dear Richard, just a note to let you know that you must have thought I was slightly ditsy when I e-mailed you and told you I was on a 50 day cruise around South America last February and wanted to be shown some condos on my one day in Manta. Unfortunately my one day coincided with Carnival so everything was closed up for the enjoyment of the event. You still took your personal time to meet me at the pier, show me around the beautiful city of Manta, Ecuador, and explain the visa and purchase process there. Just minutes before I was to return to my ship, we found my lovely 1 bedroom condo with a perfect view of the Pacific Ocean. We had just enough time to meet with your English speaking attorney, Paul Molina, and then sign the contract and a Power of Attorney to purchase a beautiful unit in the Nerea building. You knew you wouldn’t hear from me for 4-1/2 more weeks as I finished my cruise but by the time I arrived home all was in place as promised. Later when I returned to the ship I told all the friends I had I purchased the best and most expensive souvenir of the trip – a condo! Everyone was surprised but I explained my reasons for doing so. As I returned this year for a stay in my condo, I was so pleased about how wonderful the American Ex-pat situation is in Manta, including a Red Hat Ladies Group, and I already made many friends. I am looking forward to many visits in the future and highly recommend you and your staff for the quality service, experience and professionalism you offer.